Hello everyone and welcome back to another post. I HAVE FINALLY FINISHED UNIVERSITY, which means that I now have more time for blogging and youtube. This makes me very happy. It also means that I have a lot more time to go to events, which is something that I love doing and knew that I wanted to do more of in 2018. 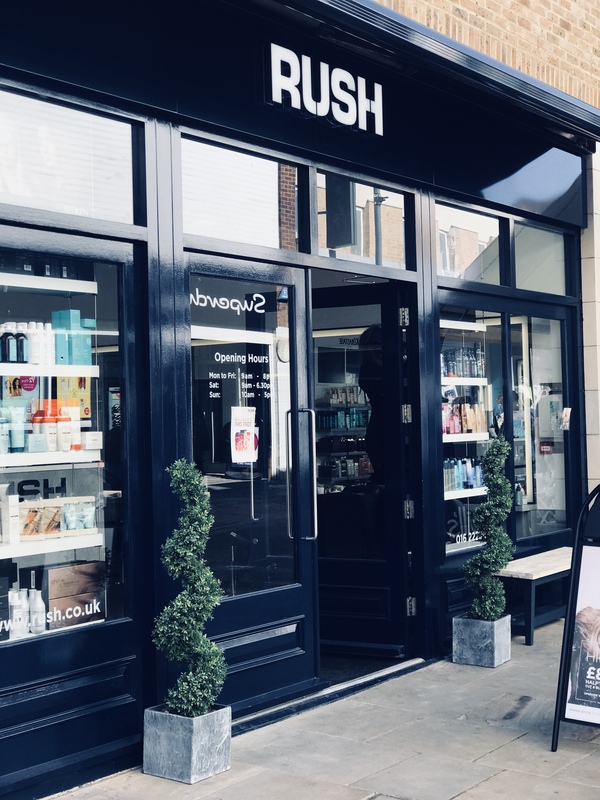 RUSH hairdressers in Maidstone kindly contacted me and asked me if I would like to pop into the store to have something done, whether this be a blow dry or a cut. I decided to have my hair cut as I really needed it cut. I never really go into hairdressers to get my hair done just because I much rather have it done in my own home. My current hairdresser, is brillant and she knows how to get my hair perfect. 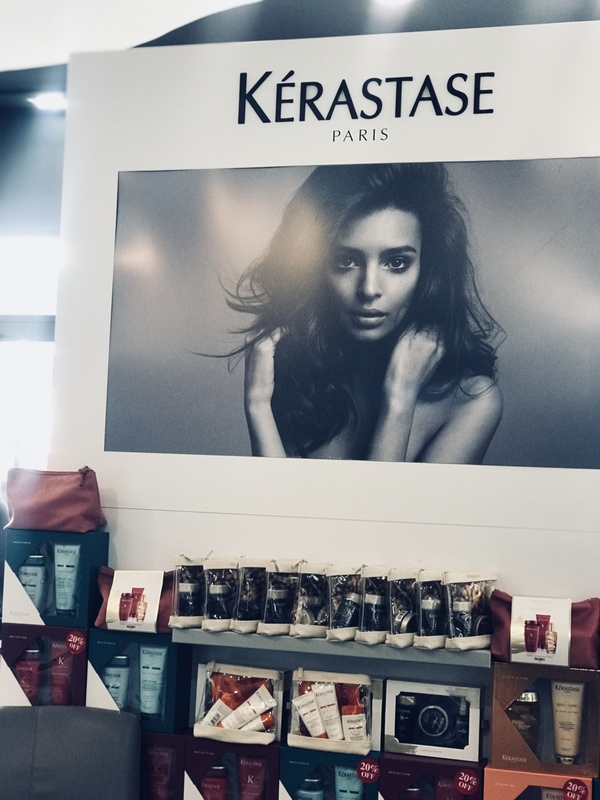 Therefore, I was really excited to go into store as i cant really remember the last time that I actually went to a proper hairdressers, but also because i wanted to review everything about it. The first thing I noticed about the store was how modern and beautiful it was. I loved, LOVED, the outside look of the shop. 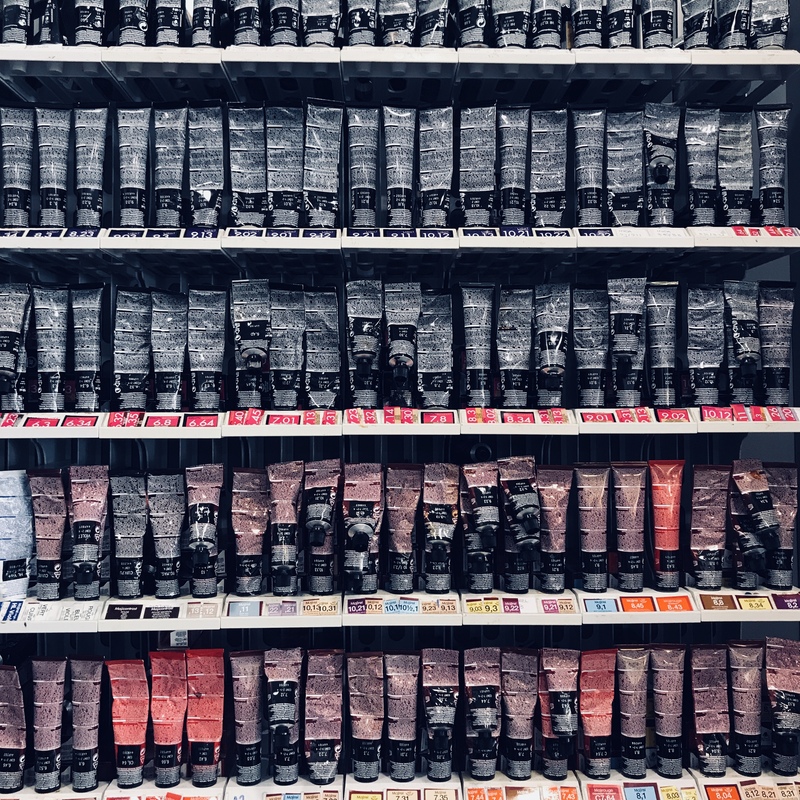 I love the dark colour of it, contrasted with all of the colour from the products in the windows. I think it looks so sleek and sophisticated. Inside was just as beautiful, it was a lovely grey colour and had lovely marble sides with massive mirrors. It looked so fresh, clean and just so professional! i loved that. Now, I know that it might sound a bit weird me saying that a hairdressers looked stunning, but honestly, the interiors of this hairdressers was to die for. It was so modern and very pleasing to look at. I had my hair washed, cut, blow dried and straightened and I think I even had a cheeky head massage, by a man called Jamie. He was honestly so friendly and fun to be around. He cut my hair perfectly and styled it how i love my own hair to be styled. 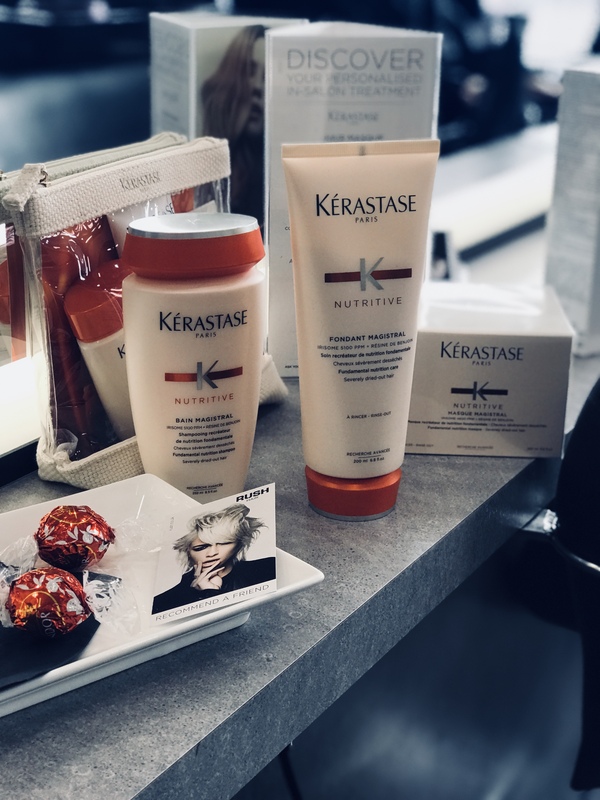 He gave me some tips aswell which i found very helpful, just about how to maintain my colour hair and what products my hair would benefit from using. Jamie, told me about this range that they sell at RUSH. 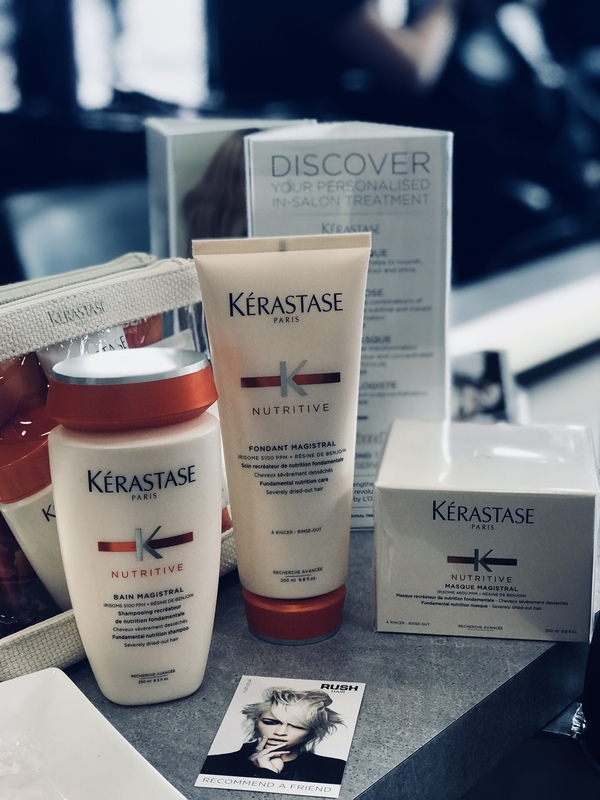 It is called Kerastase and I believe he used some of these products on my hair. I remember that they smelt absolutely amazing and I kept saying to him “oh my god, that smells so lovely”. The products that i looked at were the travel mini’s of thse products in which came in a little bag. The great thing about these were that they were the perfect limit for you to take on planes, which is so good. I am going on holiday so soon and I am thinking about picking one of these packs up. I also looked at the normal sized products and the hairmask caught my eye quite abit. The smell of these products had such a lovely smell to them, that i could literally smell them for days! NO JOKE! 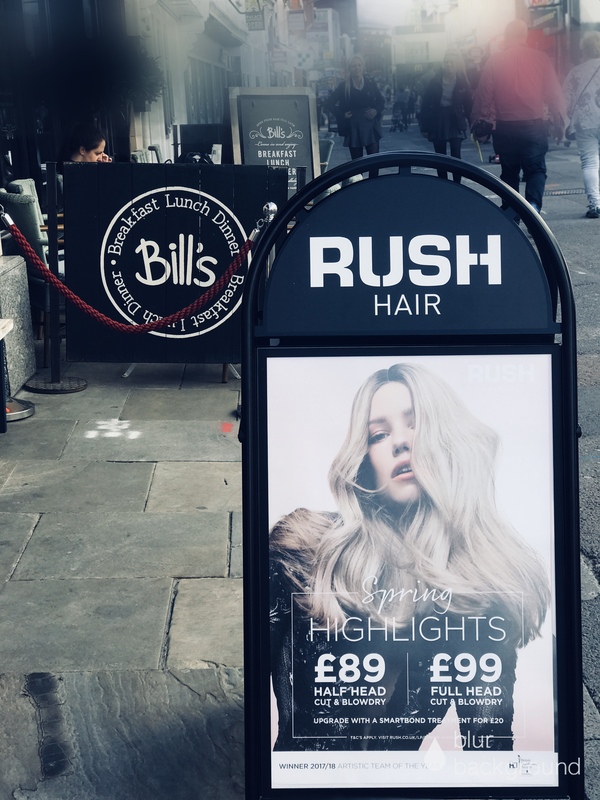 RUSH did not ask me to do a post on this event, but I honestly loved the service and the whole experience that i wanted to create a post. I also wanted to thank all of the people at RUSH who made my experience really amazing and thank you to Jamie once again for helping a girl out with her hair! Thanks to RUSH for having me, your Maidstone store really is beautiful. THERE IS CURRENTLY A 50% OFF NEW CLIENT DISCOUNT AVAILABLE! if you are looking for a new place to go to get your hair done < THIS IS PERFECT FOR YOU. Just book online and use their code ‘RUSH50’ , you will be saving a lot of money! Do you go to a hair salon to get your hair done, or do you prefer having it done at home? Previous Post Colorsport 30 day mascara & brow tint review.